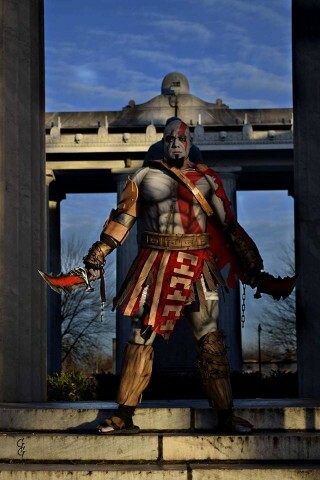 God of War Kratos Cosplay in a Perfect Setting « Adafruit Industries – Makers, hackers, artists, designers and engineers! 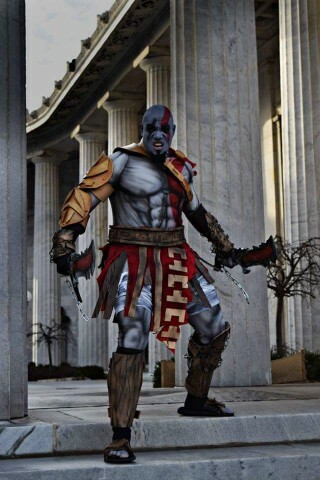 A costume like Kratos from God of War deserves an epic setting. It’s one of those ensembles that looks good on its own but better when it’s put into context, so to speak. Prolific cosplayer Michael Wilson, also known as Knightmage, did an impressive job with his replica of the character. He used Wolfe brand makeup to capture all the shading and to emphasize the character’s physique, and he got creative with the location. The game is inspired by Greek mythology so Michael found an appropriate spot for photos without traveling all the way to Greece. He happened to drive by the McKinley National Memorial in Canton, Ohio, and a light bulb went off. The majestic columns and steps are perfect.